USMC tattoo designs can help you show your pride in the corps. Get ideas for your ink right here. Tattooing is a long-standing tradition in the Marine Corps, but as Bob Dylan would say, the times they are a-changing. The Corps is cracking down on body art in an attempt to rein in its runaway popularity. Appearance is a serious point of pride with the Corps, and excessive tattooing is regarded as undesirable according to the standards that have recently been adopted. No sleeve tattoos on the arms or legs will be permitted. No head or neck tattoos will be allowed. All Marines that currently have tattoos will be photo documented for future reference. This means previous body art is grandfathered in, but new ink must meet Corps guidelines to be approved. Tattoos in general are discouraged. What this boils down to is that if you're currently in the Corps, you'd better check out your tattoo ideas with your C.O. if you want to avoid trouble. If need be, you might want to hold off on more extensive body art until your time in the Corps comes to an end. What this boils down to is that if you're currently in the Corps, you'd better check out your tattoo ideas with your C.O. if you want to avoid trouble. If need be, you might want to hold off on more extensive body art until your time in the Corps comes to an end. With USMC guidelines in mind, check out these ideas for USMC tattoo designs. Semper fidelis, or simply the abbreviated version "semper fi", has been the Marines' battle cry for ages. The term actually means "always faithful", and it speaks directly to the deep brotherhood of the Corp, as well as their love of country. Traditionally, semper fi is inked in Old English lettering, but you can really take your pick of lettering styles, depending on whether you prefer a traditional or contemporary look. You may be a aware of the close association the Bulldog has with the Marine Corps, but do you know how the relationship came about? The history dates back to World War I. The Germans grudgingly came to respect the awesome fighting capabilities of the American Marines, and nicknamed them "Devil Dogs". Upon hearing this, the Marines decided they liked the moniker, and an enterprising recruiter decided to use the imagery it brought to mind as a tool to gather more recruits. The devil dog became a tough as nails Bulldog that sent a German Dachshund running for its life. The recruiting campaign was a success, and Bulldog tattoo designs began to proliferate throughout the Corps. Today, you can still find Marines proudly sporting these tats. The image of the Marines raising the American flag at Iwo Jima has been immortalized in sculpture and film, so it's no surprise that Marines have used the image for tattoos as well. The number of details in this image are best presented on large scale, and work well as chest or back tattoos. The Corps is built on a strong code of conduct, so one of their favorite mottos, "Death Before Dishonor" is readily worked into a tattoo motif. 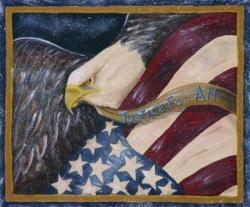 It looks great on a banner background, perhaps held in the claws of a fighting eagle. A tat of this design would look good on a shoulder or leg. If you want to keep it simple, you can simply opt for the "USMC" letters done in Old English script. If you want to enhance your tat later on, it's easy enough to work in an eagle or a flag around it. Just wait until a great idea comes to mind, and then ask your tattoo artist to draw up a design for approval. Tribal designs are so hot right now that other types of tats are being translated through this design medium, and USMC tats are no exception. Imagine a full eagle back piece created with the bold black slashes of tribal tats. It puts a contemporary twist on just about any marine design you can think of. Give your tat artist a few basic ideas and you'll see what we mean. You can see a number of great USMC tattoo designs at Grunt.com. 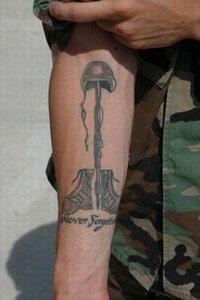 For an example of a great military tribal tat, visit Tattoos by Design. 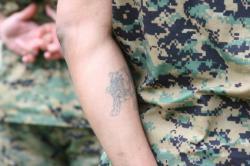 Do you have a great USMC tat you'd like to tell us about? Share it in the comments box below.